Every time that I write a novel I am convinced for at least two years that it is the last one, because a novel is like a child. It takes two years after its birth. You have to take care of it. It starts walking, and then speaking. In two months I will be eighty years old. Probably I will not write another novel, and so mankind will be safe. In other words, although I don't like them, we do need noble-spirited souls. But laughter is weakness, corruption, the foolishness of our flesh. All of us were slowly losing that intellectual light that allows you always to tell the similar from the identical, the metaphorical from the real. To escape the power of the unknown, to prove to yourself that you don't believe in it, you accept its spells. Like an avowed atheist who sees the Devil at night, you reason: He certainly doesn't exist; this is therefore an illusion, perhaps a result of indigestion. But the Devil is sure that he exists, and believes in his upside-down theology. What, then, will frighten him? You make the sign of the cross, and he vanishes in a puff of brimstone. How beautiful was the spectacle of nature not yet touched by the often perverse wisdom of man! A philosophy does not play its role as an actor during a recital; it interacts with other philosophies and with other facts, and it cannot know the results of the interaction between itself and other world visions. The sign is a gesture produced with the intention of communicating, that is, in order to transmit one's representation or inner state to another being. Living the same sorrows three times was a suffering, but it was a suffering to relive even the same joys. The joy of life is born from feeling, whether it be joy or grief, always of short duration, and woe to those who know they will enjoy eternal bliss. 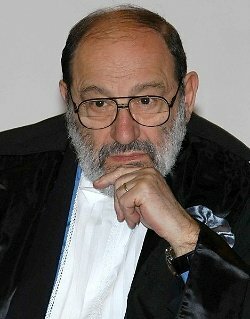 Bio: Umberto Eco is an Italian semiotician, essayist, philosopher, literary critic, and novelist.